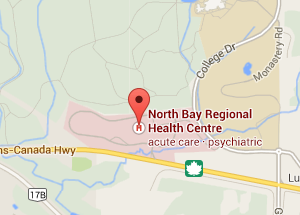 The North Bay Regional Health Centre (NBRHC) opened for patient care January 30, 2011. We are a unique healthcare organization with three primary roles—providing acute care services to North Bay and its surrounding communities; we serve as a district referral centre providing specialist services for smaller communities in the area; and we are the specialized mental health service provider serving all of northeast Ontario. 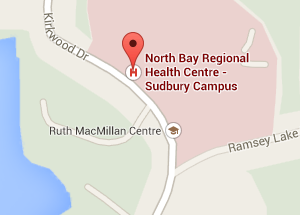 NBRHC has 389 beds and numerous outpatient and outreach services in North Bay and Sudbury and throughout the northeast region. Our health centre has been built on an 80 acre green field site, allowing us to build out and not up. 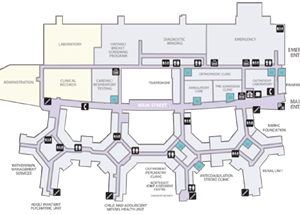 NBRHC has a total of 750,000 square feet with two levels in the west and (Regional Mental Health) and three levels in the east end (Acute Care). The distance around the ring road, the road that circles the entire facility, is approximately 1.6 kilometres (1 mile). The facility was created using natural accents such as wood, stone and plenty of natural lights. Our building was created with the patient in mind, with windows in all patient rooms; a higher proportion of private and semi-private rooms. Next to the cafeteria is a 138 seat auditorium that can accommodate large groups. The ‘Town Square’ on the Regional Mental Health Side has a wonderful downtown atmosphere, and includes a gymnasium, barber shop, corner store, bank, a beautiful clock and a horticultural centre. Kirkwood Place is located alongside Ramsey Lake in Sudbury. It provides regional mental health service programs for adults and seniors. HSN occupies the fourth floor of this building with an acute inpatient mental health unit. The facility has recently gone through some upgrades to the exterior of the building. NDSAP is a community-based substance use treatment program that offers a variety of methods of working through substance use, including residential treatment. The program occupies 2,185 m2 at the King Street facility, and provides 29 Residential Treatment beds and 10 Flex beds. Located in the same King Street West complex as NDSAP, the Mental Health Clinic (MHC) offers a variety of community-based mental health supports to people who reside in the District of Nipissing. The 3-storey, 870 m2 facility was occupied by the existing NBRHC-sponsored Programs in July 2011. Regional Outreach Services (ROS) is comprised of a number of regional outreach services which provide an array of support to individuals living across Northeastern Ontario who experience severe and persistent mental illness. The 1,230 m2 facility was occupied by the existing NBRHC-sponsored Programs in July 2011.